Survey says readers share more than they read. It's not true for all of us though, and this article is meant for the latter. There are two big problems with content on the Internet right now. The first, people share things before they read them, and the second, of the people who actually try reading, less than 50 percent get to the end of an article. In a report by Slate, back in 2013, Columnist Farhad Manjoo, very eloquently explained the behaviour of readers on Slate. Although the article takes into account only Slate's own readers and those from analytics firm, Chartbeat's other customers, it basically portrays reader behaviour all over the Internet. In fact, we see the same behaviour from our readers here at Digit. This is one of the areas where online media really lags behind traditional sources like newspapers and magazines. In those, readers, read. Don't be offended now, we all do it, and very often it's not our fault. After all, you don't always have the time to read a full story and the headline seems interesting enough to share it straightaway. Then there's the problem of data connectivity and cost. Why waste time on loading a page when you can just share it, right? Or maybe the signal dropped the moment you tapped the article. You know what's the worst? When your Twitter feeds decides to reload just when you've found a tweet worth expanding. I could keep going, but you get the drift. Like everything else in the smartphone era though, there's an app for it. There are apps for those who just do not have enough time to read and there are apps for those who really do enjoy reading, but can't find the right content to do so. They'll help you get to the...umm...bottom of the story. The Economist Espresso is aptly named. It's a morning briefing from the over 150-year-old publication. Published each weekday morning, it gives you a conscise look at important news from around the globe. The app is available for free, but non-subscribers get only a month's free trial, after which you can opt for a monthly subscription. 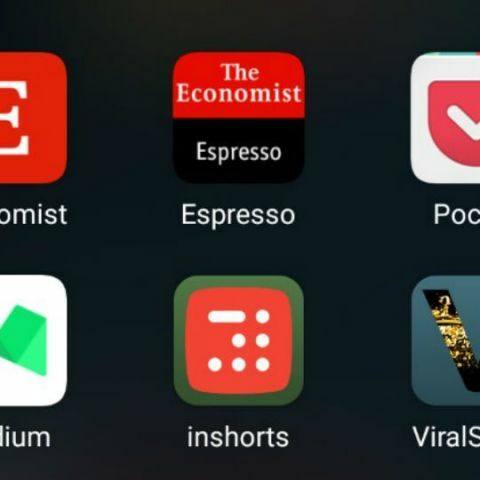 If you already subscribe to The Economist's digital editions, then the Espresso app is already available to you. It's my personal favourite, as far as news sources go. You probably already know about InShorts. Originally called News In Shorts, the app is widely advertised on Facebook and other places. It is one of the most innovative apps in recent times, and has investments from Flipkart's Sachin Bansal. Like the Espresso app, InShorts also wants to deliver news in a short and conscise manner. The app takes important news and whips up 60 word summaries of them. InShorts has been a mainstay on my phone ever since I reviewed it, last year. The best part about the app is that when you do have the time, the short-form story also has a link to the full coverage as well. I have been irked by the recent change in UI though, the slide and swipe UI was better. Formerly known as NewsHunt, DailyHunt delivers much more than just news. According to its website, the app has been downloaded 90 million times and 2.3 billion pages are consumed on it, monthly. Now that's a LOT! DailyHunt collates stories from multiple sources and has widened its reach to ebooks and competitive exam preparation material as well. If you don't like reading news from any one source, we recommend this app to you. It has multiple languages to boot. What's a read-it-later app doing in this list? Well, for one, you can save those longform articles to this. More importantly though, Pocket has a feature that many often overlook — its recommended feed. You can follow your friends and others on Pocket, and read stories that they share. It's a social approach to reading, but within a purely reading-based app, it brings you better content, faster. The crowd-sourced blogging platform is a gold mine for information and good reads. We recommend this especially to the avid readers out there. Medium isn't particularly a news app, but it gives you access to many different perspectives on your topic(s) of choice. You can even use the app to post your own scribbles. Medium is perhaps the most social approach to reading ever. It allows you to follow others, including many well known personalities, who write quite regularly. Last but not the least, Viral Shorts, as the name suggests, is an app meant for viral content. It's like the InShorts for stories that are going viral. It also condenses the information into short articles and you can read the full story when you have time. It is available in multiple languages and is a comparatively newer app on the market. The WTF stands for weird, trending and fun.